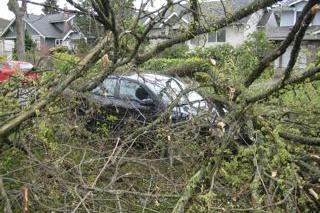 Wind brought trees down last Friday at the 2700 Block and West 38th Ave..
Not looking good for the vehicle. But, in fact, it survived okay. It only received fender damage on the front left side. Roots of the large Elm tree were cut by city crews years ago to level off the sidewalk and a resident said he thought that was why the wind took down the tree.